Reynolds Park Yacht Center has a rich history and an exciting future. Formerly known as Lee Field Naval Air Station, it was the site of one of the largest U.S. aviation training facilities during World War II. In 1946 this 1700-acre complex, located on the St. Johns River, was developed into a marine terminal to securely house the Mothball Fleet of WWII ships. Over 600 ships were stationed here until, under his first executive order, President Johnson decommissioned the facility and moved the fleet to Texas, his home state. The Navy relinquished the facility and industrialist J. Louis Reynolds, former chairman of Reynolds Metal Company, established Reynolds Park in 1965. The park remains in the family today and is now home to a diverse variety of businesses, local and international. Since established the waterfront and piers had been used mainly for commercial vessels, dredging equipment, ship building and repairing. 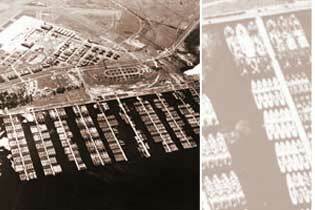 Most marinas are in restricted spaces with no room to expand. With the increasing size and number of yachts creating a demand for more yacht facilities it was decided in 2002 to develop part of the waterfront as a yacht marina to take advantage of the existing piers and available space. Reynolds Park Yacht Center is looking forward to the future and the many possibilities it holds. With more than 1700 acres there is plenty of ground for a wide variety of endeavors. Many plans are being considered including a restaurant, bar, hotel, office complex, and soccer/football recreational facility. Most recently a 3-day concert and carnival was held the weekend of Super Bowl XXXIX. Performers such as Trick Pony, Emerson Drive, Molly Hatchet and John Michael Montgomery appeared for a riveting outside concert. There was fun to have for the whole family. We look forwarded to holding more events very soon. Please check back for updates. Reynolds Park Yacht Center was originally selected due to its’ warm climate and secure, inland deep-water facility. For these same reasons, it is an ideal resting place for yachts of all sizes to find secure and highly functional berthing year round.